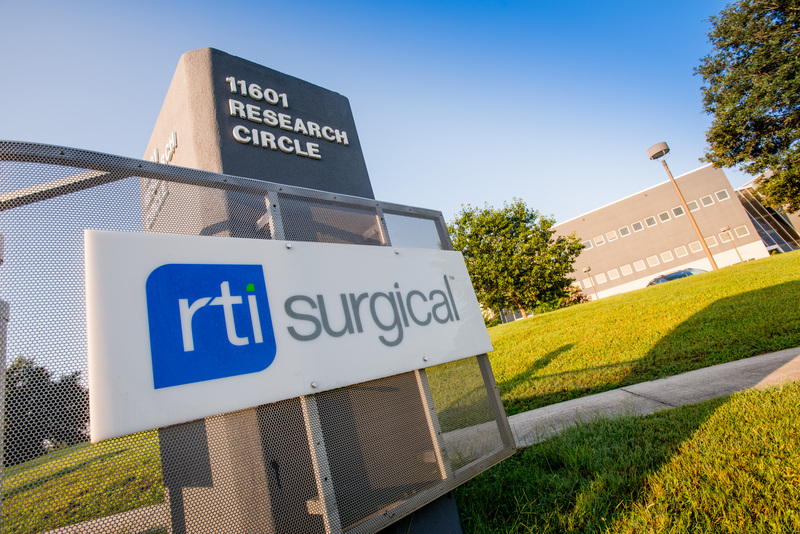 RTI Surgical® Announces Preliminary 2015 Fourth Quarter, Full Year Revenue - RTI Surgical Holdings, Inc.
ALACHUA, Fla. (Jan. 8, 2016) – RTI Surgical Inc. (RTI) (Nasdaq: RTIX), a global surgical implant company, announced today preliminary unaudited fourth quarter and full year 2015 revenue. Worldwide revenues were $76.1 million for the fourth quarter of 2015 compared to revenues of $70.9 million for the fourth quarter of 2014. Domestic revenues for the fourth quarter of 2015 were $70.6 million compared to revenues of $65.4 million for the fourth quarter 2014. International revenues for the fourth quarter 2015 were $5.5 million, which were comparable to the fourth quarter of 2014. On a constant currency basis, international revenues for the fourth quarter of 2015 grew 11 percent. Worldwide revenues were $282.3 million for the full year 2015 compared to revenues of $262.8 million for the full year 2014. Domestic revenues for the full year 2015 were $260.4 million compared to revenues of $238.9 million for the full year 2014. International revenues for the full year 2015 were $21.9 million compared to revenues of $23.9 million for the full year 2014. On a constant currency basis, international revenues for the full year 2015 grew 4 percent. The company expects to release its full fiscal fourth quarter and full year 2015 results on Feb. 16, 2016. This communication contains forward-looking statements within the meaning of the Private Securities Litigation Reform Act of 1995, including those regarding our anticipated preliminary unaudited fourth quarter and full year 2015 revenue, the release of our full fourth quarter and full year 2015 results and our plans for continued growth in 2016. These forward-looking statements are based on management’s current expectations, estimates and projections about our industry, our management's beliefs and certain assumptions made by our management. Words such as "anticipates," "expects," "intends," "plans," "believes," "seeks," "estimates," variations of such words and similar expressions are intended to identify such forward-looking statements. In addition, except for historical information, any statements made in this communication about anticipated financial results, growth rates, new product introductions, future operational improvements and results or regulatory actions or approvals or changes to agreements with distributors also are forward-looking statements. These statements are not guarantees of future performance and are subject to risks and uncertainties, including the risks described in public filings with the U.S. Securities and Exchange Commission (SEC). Our actual results may differ materially from the anticipated results reflected in these forward-looking statements. Copies of the company's SEC filings may be obtained by contacting the company or the SEC or by visiting RTI's website at www.rtix.com or the SEC's website at www.sec.gov.